My task is to draw a lot of small images in a certain order on one large one. I'm using TBitmap32 from Graphics32 Library. Since TBitmap32 is a descendant of TThreadPersistent, it inherits its locking mechanism and it may be used in multi-threaded applications. I want to use all the power of OmniThreadLibrary and bring this rendering loop to a separate thread(s). Which one of the proposed abstractions should I use? ForEach, Fork/Join, Map or something else? Please give me advice and an example applicable to my task. If GetTitleFromDB() is using more DB connections and is multi-threaded and if this function is the main bottleneck then it makes sense to parallelize this for loop. Otherwise you can test but I think it will be no gain or even worse because LargeImage will not execute anything in parallel. Looking is per instance and you have only one instance. You can use a BlockingCollection from OTL to separate the DB access from the rendering part. While you render a tile the next tile is retrieved from DB in parallel. I think it will be no gain or even worse because LargeImage will not execute anything in parallel. After more thinking I agree with you. I will do without multithreading when creating a single LargeImage. I need to create multiple different LargeImages in parallel and then merge them into one resulting image. Schematically, as in the attached image. The number of LargeImages is not constant (!) and can be from 1 to 5. Each LargeImage is created from unrelated databases (there are no problems with competing DB connections). 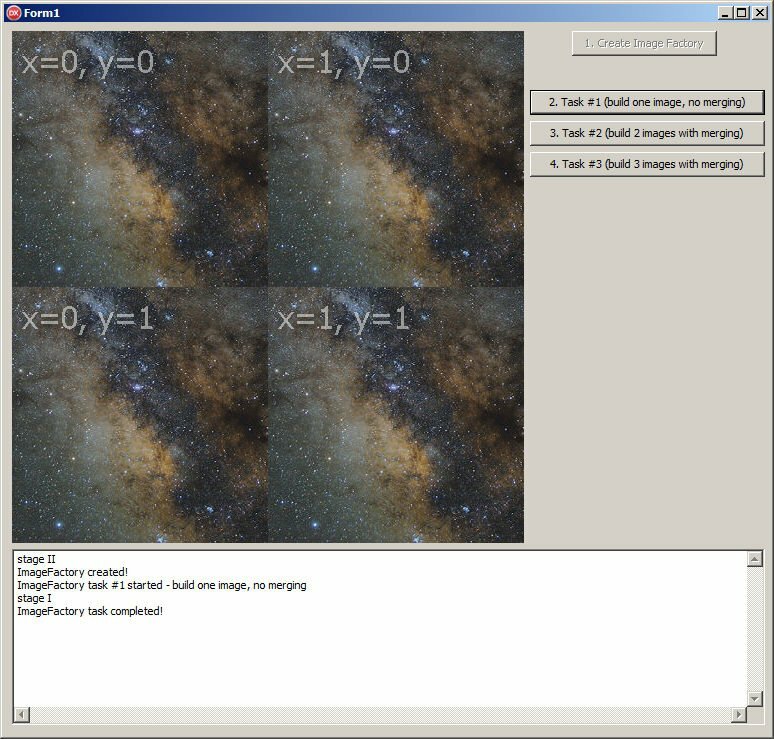 If the number of LargeImage is 1, then ResultImage = LargeImage1. Moreover, this operation of building LargeImages and merging them is repeated many times during the application life cycle. That is, I need to have a some "image factory" that is constantly running in the background. I do not understand how to do this using OmniThreadLibrary abstractions. I would be very grateful if someone could help me create a sketch of the code for this task! 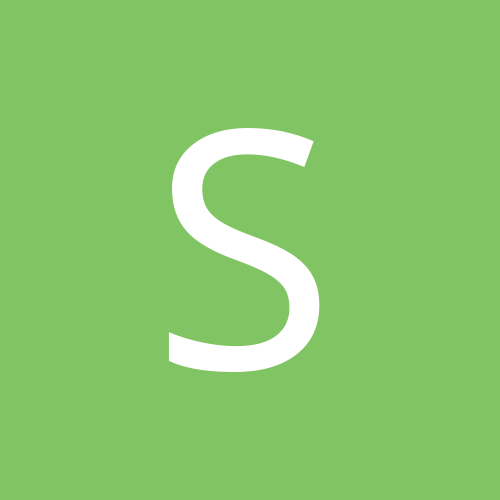 • Wait for subtasks to terminate. • Use results to compute higher-level result. 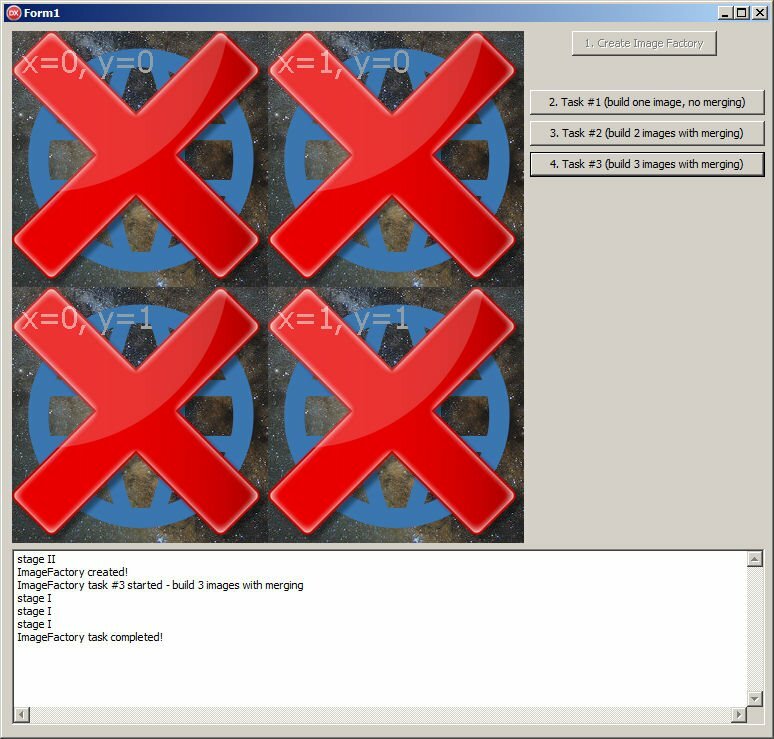 Isn't that for my case (to create multiple different LargeImages in parallel and then merge them into one resulting image)? You have to paint small pictures and then put them all together to a big picture. How can you speed it up? Get a friend to paint the small pictures (a task) and put them in a queue (BlockingCollection) from where you take them and put them togehter to the big picture (another task). How can you speed it up? Ok, I get it. That answers my original question, but now I'm curious about my next question. How to implement some kind of "image factory", which is constantly running in the background? It must have a variable number of parallel subtasks to create each image. In my opinion, the "pipeline" abstraction is not suitable for this, since it is a sequential conveyor. Dear Primož, please could you give me some advice on how to implement my "image factory"? With a variable number of parallel tasks and constantly working in the background. Everything is as I described above. Please!!! Pipeline would work as you can run each stage in more than one parallel task (by using .NumTasks). But Parallel.BackgroundWorker is probably more appropriate. Assign each tile a sequential number. The job of reading a tile from the database can be delegated to one or more tasks, depending on how you choose to partition the workload. A DB tasks reads a request from a (threadsafe) queue, performs the database request, stores the result in the request object and notifies the requestor that the result is ready. The request object contains: 1) Tile number, 2) Result bitmap and 3) Signal object (e.g. an event handle). 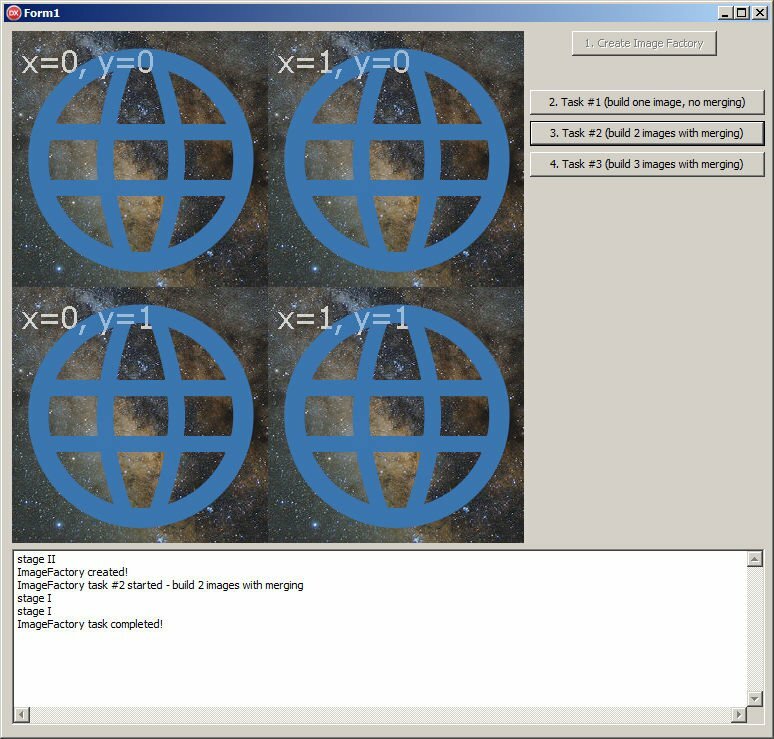 Create a number of tasks to render the tiles. Each task grabs a Tile Number (just use a InterlockedIncrement() on a shared integer), creates a DB request object, queues it and waits for the result. Once the result is ready the task draws the tile onto the target bitmap (*) and starts over. To avoid cache conflicts it would be best if the Tile Numbers currently being worked on are as far apart as possible, but I guess the DB overhead will make this optimization irrelevant. *) A TBitmap32 is just a chunk of sequential memory and since none of the tile tasks will write to the same memory it is not necessary to lock the target bitmap. So in short: One thread pool to render the tiles and one thread pool to read from the database. A work queue in between them. However like @Cristian Peța said, unless you are using some super fast ninja science fiction database, there's no reason to try to optime the rendering much. All the tiles can probably be rendered in the time it takes to make a single database request. In fact, using graphics32, a thread context switch will take far longer that drawing a single tile. So in practice I would probably just do away with the DB tasks and execute the database request directly from the rendering tasks. Thank you for the helpful tips! I will experiment more with these techniques. First you need to know much time takes GetTitleFromDB and RenderTitleToBitmap32. Then you will know where to optimize. For SQL servers hawing many small requests is costly. I don't know how much KB GetTitleFromDB is asking but generally reducing the number of requests (bigger data chunks) is better for client and for server also. 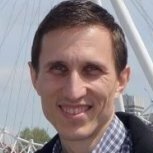 @Cristian Peța you can optimize (nearly) every pipeline switching from serial to parallel. @Schokohase if you are speaking about my suggestion to read bigger chunks from DB then this is not exactly parallelization. And the second suggestion was about what to optimize. If reading from DB takes 10ms and rendering 0.1ms per piece then I would not care about rendering. I'm not sure I did it right. And now I have a bunch of questions, mostly trivial. If you can answer any, please do. 2) Why can't I restart any task? I get "Adding to complete collection" error. 3) How to terminate the pipeline correctly? Sometimes my app remains hanging in task Manager after closing. 4) Are LargeBitmaps created in parallel when there are several (for task #2/#3)? Despite the increase in FPipelineImageFactory.NumTasks for task #2/#3, the number of threads has not changed in the debugger. Also it is noticeable in the log - the line "stage I" appears sequentially. 5) Getting the result - Image32.Bitmap.Assign(FResultBitmap) in OnStopInvoke method - is that right way? If not, how do I get this correctly? I carefully read the "3.9 Background worker" chapter from the "Parallel Programming with OmniThreadLibrary" book, and - hallelujah! 1) If I change numTasks value in Renderer := Parallel.ParallelTask.NumTasks(numTasks).NoWait line to Environment.Process.Affinity.Count - 1, the application starts to work incorrectly. The code after Renderer.WaitFor(INFINITE); line is never executed and my app remains hanging in task Manager after closing. Is this my bug or OTL bug? "Access violation at address 00604CBF in module 'ImageFactory_BackgroundWorker.exe'. Read of address 00000000." Why? After all, TOmniValue is the owner of TObject-type data! When a object-owning TOmniValue goes out of scope, the owned object is automatically destroyed. But this is not so in my case, so I would like to know why it happens. Is this OTL bug? Dear @Primož Gabrijelčič, please could you answer these questions? Also, your opinion on my ImageFactory code is very important to me! Especially the asynchronous part of the code. Maybe is there a better/easier/rather way to do this? Questions from my last post are still relevant 10+ days later. Dear @Primož Gabrijelčič, please reply! PS If this OTL subforum is not intended for questions, I am sorry for the time I have wasted. Is there another forum that I can ask specific OTL question and get an answer from the developer? 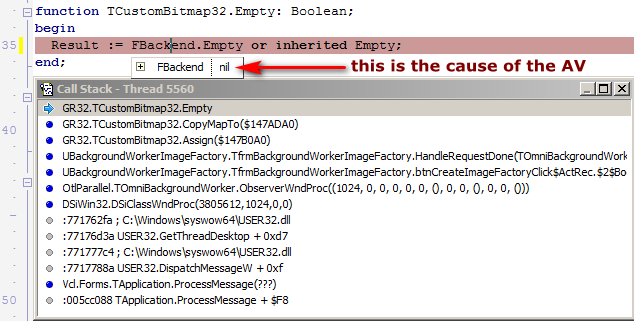 FWIW @Shrinavat you should have been able to determine the cause of the AV on your own by just looking at the call stack in the debugger. If this is beyond you then multi threading is not for you. If I comment out workItem.Result.OwnsObject := True line in Asy_Factory procedure and uncomment workItem.Result.AsObject.Free; line in HandleRequestDone procedure, FBackend is not nil. It's a bug. But whose? Mine, GR32 or OTL? Indeed, if you set `workItem.Result` as owned object, it gets destroyed immediately after the `Asy_Execute` exits. At the moment, don't use `OwnsObject` or `AsOwnedObject` at that point. I'll dig in to see what's going on. Maybe somebody can tell me what is going on because I'm clueless. I'll see if I can change the implementation of `IOmniWorkitem` to prevent such problems.